I am terrible with time change. This weekend we are supposed to “fall back” our clocks. I know this gives us an extra hour, but it always screws me up. The kids don’t understand the extra hour, so they wake up at 6 instead of 7. My body doesn’t actually understand either. I am conditioned, we are all conditioned, it is human nature. There is something in us that likes uniformity. Even the most rebellious among us have a pattern, have a system. Some people thrive in change, I had a friend Charlie-God rest his soul-(miss you Charlie) who grew up as a child of a missionary and loved change, but he suffocated in things “staying the same”, in consistency. For him that meant he needed to move every few years, meet new people, his routine was changed by staying in one place. I have been proving this never disputed “change is hard” theory in the past month or so at church. We have been (slowly) updating our bathrooms. First, we made them unisex bathrooms because they are just a room, not stalls. But the men still use the old “men’s” bathroom and the women still use the “women’s” bathroom. 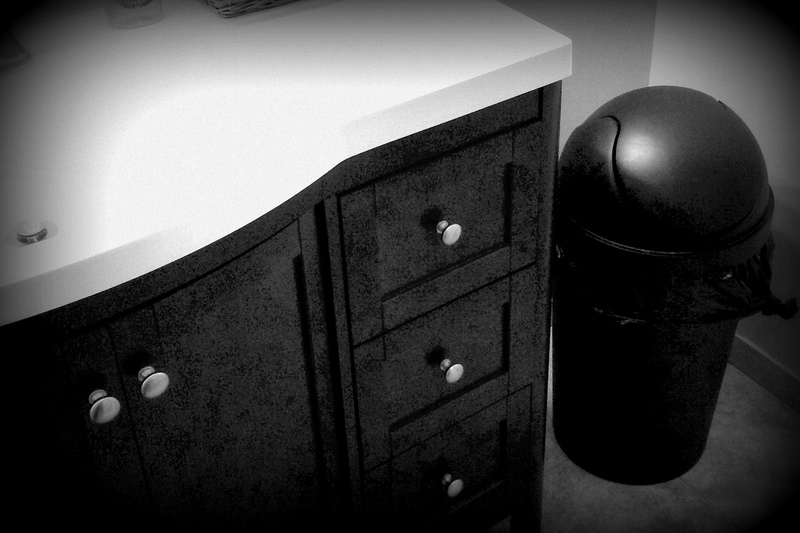 But what has been most fun is that when the former woman’s bathroom was redone we moved the trash can next to the vanity. Everyday I walk in to the bathroom or multiple times a day and the trash is moved to where it used to be, cramped next to the door instead of taking advantage of the space. If you think i’m crazy, I am. But it’s a whole lot of fun. I am driving someone in our office (probably the preschool because the church office knows all about this) crazy by moving the trash can to the new and ahem… “right” location. And every time they go in they move it back. Yes, this is fun for me. Judge away. But I laugh and move it because I like things the way I like them (see post on this subject: To Perfect or Not Perfect) and because I wonder how long it will take for this “change” to become a reality and the “new normal” and constantly stay in one place. Years ago when I decided to stop fighting this thing I call God in my life I changed, but I also didn’t. I simply lived into the thing that was most constant in my life but how I responded to that constant changed. I had a choice, I could live into God’s call and change my ways. I could choose the way of love. I could love myself and others, even in the hardest of circumstances (I am not perfect at this, but I strive). And I could accept the grace that I was being sent my way. This is the essence of God, these are the 2 things- love is the change, always fluid in my response and acceptance, and the constant- grace. Love changes by how we exchange it in relationship, grace is constant and freely given without action or choice. Love and grace, earth and heaven, human and divine.